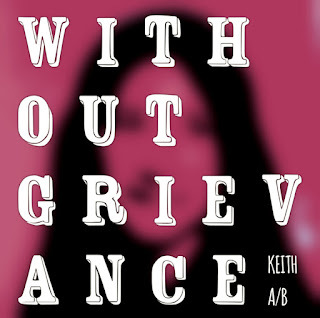 If It's Too Loud...: Keith A/B - "Without Grievance"
According to his brief Bandcamp bio, "Keith A/B is a singer-songwriter from the Providence area." But that doesn't really describe his newest album, Without Grievance. The opening song, "Hey Kelly," does not fit what you'd expect from a singer-songwriter. That term conjures an image of an acoustic guitar and something along the lines of folk, or maybe some mainstream, straight up rock music. Instead, "Hey Kelly" sounds like Jason Lowenstein's contributions to Sebadoh. It's much louder and more dissonant than a singer-songwriter usually sounds. From there "I'd Be a Success" sounds more like a singer-songwriter, but only because it's more mellow. It still has an undercurrent of abrasive noise lurking underneath. It's not until the fourth track, "No Black Magic Required," that Without Grievance almost sounds like a traditional singer-songwriter, but once again even this song goes off in its own direction. And these are all good things. You can listen to "Hey Kelly" below. Without Grievance is out now via 75 or Less Records. You can get a copy via Bandcamp. For more on Keith A/B, check him out on Facebook.